Lukaku was in sensational form today. ROMELU LUKAKU SCORED a late brace to send Everton into the FA Cup semi-finals with a 2-0 win over his former team Chelsea, whose miserable week ended with a Diego Costa red card. The Stamford Bridge outfit were knocked out of the Champions League by Paris Saint-Germain on Wednesday, meaning both sides were left with a remaining target of FA Cup glory to salvage underwhelming seasons. This all-or-nothing feel influenced most of the first half, where two fully committed teams were hindered in their search for fluency and creativity in a high-octane contest. Things opened slightly after the break, with Costa and Everton’s Ross Barkley both going close before Lukaku scored his first goal in five appearances against a club where he was deemed surplus to requirements. The Belgium international darted inside Cesar Azpilicueta and Branislav Ivanovic, powered past Jon Obi Mikel and twisted Gary Cahill inside out before finishing unerringly in the 78th minute. Four minutes later he sprung the offside trap to make it two, leaving Costa to encapsulate Chelsea’s frustration by collecting a second booking for pushing match-spanning gripes with Everton midfielder Gareth Barry too far. Barry himself collected a needless second caution for a foul on Cesc Fabregas shortly afterwards but his manager Roberto Martinez was able to celebrate a much-needed triumph. The first half was typified by the start of Costa and Barry’s feud, which earned the Chelsea striker his first yellow and offered further encouragement for a vocal Goodison Park crowd to involve themselves in the occasion. A tough-tackling encounter was punctuated by Costa throwing himself to the ground amid a tussle with Phil Jagielka in the Everton area, with referee Michael Oliver unmoved by his penalty claims. Joel Robles leapt to deny free-kick specialist Willian two minutes from the end of a half where the Everton goalkeeper had little else with which to concern himself. In a rare show of Costa’ ability on the ball, he latched onto Fabregas’ immaculate throughball and skipped around Ramiro Funes Mori and Joel before pulling a shot across the face of goal with the angle against him. A rampaging Aaron Lennon sewed confusion in the Chelsea box, Barry eventually sending the cutback to Barkley, who blazed wide. Thibaut Courtois came out sharply to thwart Lukaku on the end of Cleverley’s 71st-minute throughball, while Everton full-back Seamus Coleman made a crucial back-post clearance with Kenedy lurking. 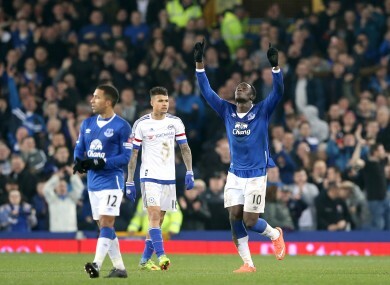 Lukaku’s sensation solo effort of poise, pace and power brought Goodison to its feet and he needed no invitation to dispatch Barkley’s well-weighted pass as the Chelsea offside trap failed and their hopes of silverware evaporated in the space of five minutes. Six minutes from time, Costa barged, rutted with and then hugged Barry – an exchange that finally exhausted Oliver’s patience. Ex-Manchester City man Barry was also booked for his part in the ruckus, then tripped Fabregas to ensure Guus Hiddink’s first domestic defeat in his second spell in charge of Chelsea ended as a game of 10-a-side. Email “Lukaku goes full beast mode with brilliant individual goal to dump Chelsea out of the FA Cup ”. Feedback on “Lukaku goes full beast mode with brilliant individual goal to dump Chelsea out of the FA Cup ”.